Dominic has more than 25 years of experiences in providing Design & Consultancy for Building M&E Services; Parks & Building’s Facilities and Assets Management (FM & AM); Manufacturing Process Engineering with Best Practices and Integrated Knowledge of ICT + Internet of Things (IoT) + Cloud Solution + Big Data Analytics. 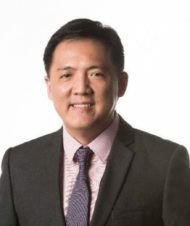 Currently the General Manager of Digital FM for SMM Pte Ltd, a member of the Surbana Jurong Group, Dominic is spearheading a Digital Team with competencies to commercialize and deliver BIM:FM and Smart:FM deliverables to the market. The team is working closely with BCA’s BIM Steering Committee for BIM FM to test bed and develop technology & methodology for the next lapse of Digital FM advancement. This is in line with the Construction Industry Transformation Map (ITM) in driving the Integrated Digital Delivery (IDD) and the Integrated Project Delivery (IPD) with good understanding of Design for Manufacturing and Assembly (DfMA).